When it comes to marketing your business or organization on the internet, few goals are as important as showing up on page 1 in Google search results for keywords that are relevant to your product or service. But what are the keywords you should be focusing on? 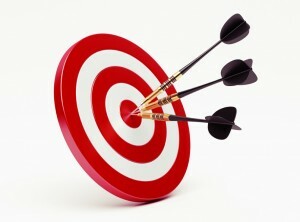 Most of us can think of some target keywords for our business or organization quite easily. But are they the most popular terms for your product or service? Sometimes the keywords we use most often to describe our business are not the most popular terms for search. It’s important to understand what keywords people are using most often to find your product or service and provide adequate keywords support on your site. There are some free tools available to help with this including Google’s Keyword Planner and Wordtracker. Google’s Keyword Planner requires you to create an Adwords account but you don’t have to spend any money. It’s worth it because their tool provides a lot of related keyword suggestions along with search volume information. Wordtracker also requires you to create an account and provides a decent amount of information for free. If your business or organization serves a localized market, you need to consider geographical keywords. For example, if you sell shoes in Santa Rosa, you would want to rank well for “shoe stores in Santa Rosa” and may not be as concerned with “shoe stores in Dallas”. For geographical keywords, you want to consider your serving area, based primarily on population. Make a list of the towns, cities and regions you serve and determine which geographical keywords are used most often for search. 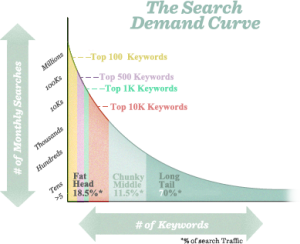 Long tail keywords are search entries that have a large number of keywords in them. For example, “shoe store in santa rosa that sells red basketball shoes cheap” would be a long tail keyword. 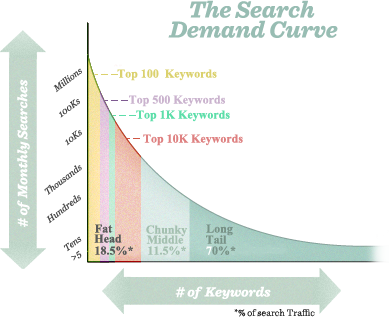 The interesting thing about long tail keywords is that they make up 70% of all search queries as shown in the graph. The challenge of course, is figuring out which long tail keywords you should support. But in a way, this is where everything that you and Google want converge. Remember, Google has never been in the business of promoting a business. Their search engine wants to provide the best results for whatever people search for. They have always said they want fresh content that is not written for search engines. So if you provide lots of interesting content, tailored for your site visitors, you are more likely to match long tail keywords and capture a larger part of the search market. Content is king. In other words, rather than trying to stuff “red basketball shoes” throughout your site, a better strategy is to write more content about basketball shoes. For example, a blog post describing the newest basketball shoes you’ve added to your inventory, color options and the great discount pricing being offered is more likely to match on many related long tail keywords. Long tail keyword support is critical and should not be overlooked. There are a number of tools available to help with this but you may want to use Google’s Keyword Planner for this as well. Good long tail keyword support involves understanding what questions your visitors may be asking and providing answers in your content rather than just thinking in terms of search volume. If you know basketball shoes are a popular item, provide collateral content on the subject. Provide content that is a unique and helpful for your visitors and you will be rewarded with an increase in long tail search traffic. We suggest creating a table listing your keywords down the side and your top competitors across the top as well as your own site. Go through each keyword phrase and note where you and your competitors rank. Be sure to include the geographical variations as some locations may be under supported. search volume versus competition – should you do battle for the most heavily searched keywords or focus on some under supported phrases? geography – are there nearby areas that aren’t as well supported when you could easily rank at the top of listings? should you add additional pages to your site to provide support for specific keyword phrases? should you add additional content to your site? Yes! Content is king! A thorough keyword analysis may take some time and effort, but it’s worth it, allowing you to focus your SEO efforts where it will count the most.